The projects presented at conferences are reflective of the School’s mandate to be socially accountable to the diverse cultures of Northern Ontario. Conferences also provide opportunities for collaboration and networking between students, residents, and community-based researchers, helping to grow quality research programs for and by the North. The Northern Ontario School of Medicine’s Northern Health Research Conference—more commonly known as the NHRC—has been held annually since 2006. It is hosted in communities across NOSM’s wider campus of Northern Ontario and provides an opportunity for researchers in the region to present their research and exchange research ideas. This conference demonstrates NOSM’s commitment to research, health care, and education to the people of Northern Ontario and beyond. The NHRC explores research activities arising from community-based activities and highlights projects underway from students, residents, and community-based researchers. The conference provides opportunities for collaboration and networking. 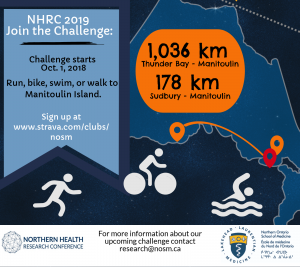 Leading up to the 2019 Conference, NOSM’s Associate Dean, Research, Dr. Penny Moody-Corbett will be running the distance to Manitoulin Island. If you would like to join Penny in this challenge, please contact research@nosm.ca for details.